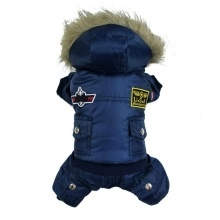 Made of comfortable material pet clothes is thicken and help your dogs to keep warm in the cold winter. Waterproof, rainproof and high warmth retention property. Different size can meet various dogs shapes. Thicken cotton clothes help your pets to keep warm.